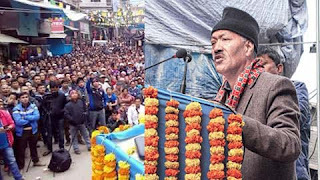 Kalimpong MLA Harka Bahadur Chhetri who is set to float a new political party called for an end to politics of "sentiments" and stopped short of selling the Gorkhaland dream at a public meeting in Bijanbari today. The two other main speakers, Mahendra P. Lama and Amar Lama, however, raised the statehood issue at the rally. The Gorkha Janmukti Morcha has been attacking Chhetri and his team over the past couple of days, saying they were not bothered about the Gorkhaland issue. "Gorkhaland has become a signboard. One can use it to sell anything," said Chhetri. "Let's stop politics of sentiment. Just because someone in Siliguri on seeing us (hill people) says whether we want to go to Kakarvitta (border town in Nepal), we get emotional. We can simply tell them that we are not going there (Kakarvitta)," he added. After the meeting, when asked about his stand on Gorkhaland, the Kalimpong MLA said: "The ultimate goal is Gorkhaland but at the moment, we want to create a strong foundation for it." However, Amar and Mahendra sought to counter the campaign by the Morcha that they were not keen on the statehood issue. "A false propaganda is being spread against us. We want to say we have not left the statehood demand," said Amar. In his address, Mahendra, the former vice-chancellor of Sikkim University, said: "The seed of statehood has been sown from Bijanbari (Bijan in Nepali means seed)...... The statehood demand, however, is slowly dying as Gorkhaland is not being raised in Parliament (by Darjeeling MP S.S. Ahluwalia). This is very sad. One cannot get Gorkhaland at Jantar Mantar or in the shopping malls of Delhi." All the three main speakers during most part of their speeches criticised Morcha president Bimal Gurung and others in the party. Bijanbari is around 40km from Darjeeling. Sources said Chhetri was likely to announce the launch of a new party on January 14. Strong foundation needed for Gorkhaland says MLA Harka Bahadur Chhetri, Chhetri who is set to float a new political party called for an end to politics of "sentiments" and stopped short of selling the Gorkhaland dream at a public meeting in Bijanbari today.